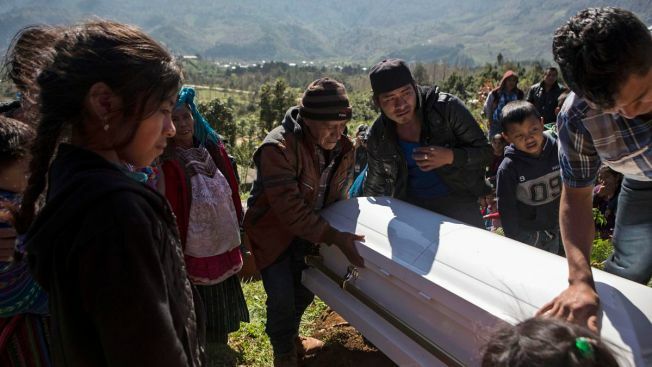 People lower the coffin of Felipe Gomez Alonzo, an 8-year-old Guatemalan boy who died in U.S. custody, into his tomb at the cemetery in Yalambojoch, Guatemala, Sunday, Jan. 27, 2019. On Christmas Eve, the 8-year-old boy became the second Guatemalan child to die while in custody near the Mexican border. Villagers in this remote indigenous community of western Guatemala did their best Sunday to give a proper farewell to Felipe Gomez Alonzo, the 8-year-old migrant boy who died in U.S. custody at a New Mexico hospital on Christmas Eve. They held a candlelight vigil, draped his small white coffin with flowers and then carried him to his final resting place. Older sister Catarina scratched his name with a stick into a simple concrete headstone. Women in brightly embroidered shirts and skirts oversaw the last rites since many of the men in the village left for the U.S. long ago. The hamlet, set on a plain and surrounded by misty, pine-covered mountains, is a place of crushing poverty and lack of opportunity, home to a single small school, dirt roads that become impassible during the rainy season and rudimentary homes without insulation, proper flooring, water or electricity. The community is populated by families who fled to Mexico during the bloodiest years of Guatemala's 1960-1996 civil war but returned after the signing of peace accords. There are no jobs, and people live off meager subsistence farming and local commerce. Residents say the Guatemalan government has turned a blind eye to their plight, a complaint that can be heard in other impoverished villages in the country. It was extreme poverty and lack of opportunity that drove Felipe's father, Agustin Gomez, to set off for the U.S. with the boy, the family has said. Others from the community had been able to cross the U.S. border with children, so he figured they would have the same luck. Felipe was chosen because he was the oldest son. Felipe and Agustin were apprehended by the U.S. Border Patrol in mid-December. After nearly a week in custody, the boy developed a cough, fever and began to vomit. New Mexico authorities said an autopsy showed Felipe had the flu. He was the second Guatemalan migrant child to die while in U.S. custody in December, sparking concerns of inadequate conditions at detention facilities.